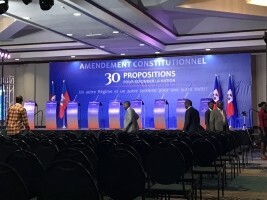 After 17 months of work, the Special Committee of the Chamber of Deputies on the amendment of the Constitution http://www.haitilibre.com/en/news-22775-haiti-politic-constitutional-amendment-the-diaspora-wants-representatives-in-parliament.html presented this week at the Karibe Hotel, thirty proposals for amendments to the Constitution, including two for the benefit of the diaspora. Proposals that according to the Deputy Jerry Tardieu, President of the Commission reflects overall, the opinion of citizens. The Commission proposes that Haitians living abroad be represented in the Parliament of Haiti by 8 deputies and a senator. Deputies and regions concerned: USA, Canada, South America, Mexico, Central America and the Caribbean, Europe, Africa and Asia and the Dominican Republic (1 Member of Parliament per country and region). Plus 1 Senators for all Haitians living outside. Regarding the restoration of political rights, the Commission proposes new constitutional provisions on nationality allowing the restoration of political rights for all Haitians without distinction, giving the right to vote in Haitian elections and parliamentary representation for Haitians living abroad . The Commission proposes that the political system of the 1987 Constitution be replaced by another one in which the executive will be composed of a president and a vice-president elected by universal suffrage. The post of Prime Minister (the Primature) is eliminated. The Commission proposes to reduce the number of parliamentarians to one senator per department and one deputy per arrondissement, whose mandate would be 5 years for all. The Commission proposes that municipal cartels of three members be replaced by a single mayor elected by universal suffrage assisted by a municipal assembly composed of councilors (former member of CASEC) of each communal section. The Commission also recommends the elimination of the ASECs but to discuss the advisability of keeping the former city delegate, who would become a municipal councilor. The Commission proposes that the audit of the public accounts should now be entrusted exclusively to the Superior Court of Accounts and Administrative Disputes (CSC/CA) for all categories of public accountants and that it will be the only authority authorized to grant the certificate of discharge. The Commission proposes the obligation for the President of the Republic to publish the laws and other acts of the legislature and of the National Assembly in the official journal of the Republic within a period not exceeding 15 days (after the objection period of eight days). Otherwise, the Parliament would have the authority and the obligation to send the law to the Official Gazette of the Republic for promulgation. The Commission proposes that Article 284.3 be completed by specifying the possibility of consulting the people by referendum on major decisions. The Commission now intends to enter into discussions with the Senate so that Parliament can possibly make a proposal for a consensual amendment submitted for ratification to both Houses of Parliament before the end of the last parliamentary session (2019) to meet the deadline set for the Article 282.1 of the Constitution.